Timothy Castagne, Hans Vanaken, Leandro Trossard, Birger Verstraete: Who are Belgium's newcomers? Belgium newcomers Birger Verstraete and Leandro Trossard talk to Sky Sports News about their international berths. Today there are 51 Belgian footballers playing their club football across Europe's 'big five' leagues - not bad for a country of just 11m people. England hosts the most - 18 in total - but those Belgians still playing their domestic football inside its borders get less attention, and that might be why four new names to the Belgium squad this past week, all of whom played in Belgium last season, have slipped somewhat under the radar. The country's 4-0 friendly win over Scotland at Hampden Park on Friday was another typically impressive Belgium performance, with Eden Hazard man of the match, scoring a stunner and creating further goals for Romelu Lukaku and Michy Batschuayi, who scored twice. But what did not make the headlines - outside of Belgium at least - were these four new names selected by Roberto Martinez, three of whom made their international debuts. Timothy Castagne was selected in place of Thomas Meunier against Scotland. Timothy Castagne, who moved from Genk to Atalanta in the summer for £5.4m, started ahead of the experienced Paris Saint-Germain right-back Thomas Meunier, who played every minute of the World Cup in Russia except for that 'dead rubber' against England in the final group game. For the 22-year-old Castagne, they were big boots to fill, but he impressed people at Hampden, nobody more so than Martinez, who has had his eye on him for a while. The ex-Everton boss likes a player with versatility and said: "Timothy can play on the right or left, or in central defence. He's been very impressive with our U21s." Castagne is relishing the chance given to him and is already thinking of unseating Meunier, telling Sky Sports News: "I think there is a permanent place in the squad up for grabs and I want it. It's amazing to be in a team with some of the world's best players. "Training with them will make me better. It will help me progress. I get on well with Thomas. We have no rivalry. He is number one - for now." If starting ahead of Meunier is daunting, imagine coming on as a sub to replace the in-form Hazard. That's exactly what Club Brugge's Hans Vanaken had to do after an hour play. Hans Vanaken replaced Eden Hazard late in the game as Belgium won 4-0. He is not exactly young anymore, turning 27 last month, and has played almost 300 games in Belgium, but his recent performances - creating and scoring for the current Jupiler League leaders - have caught the eye of Martinez, who insists he is "a consistent performer and has earned his place in the squad". 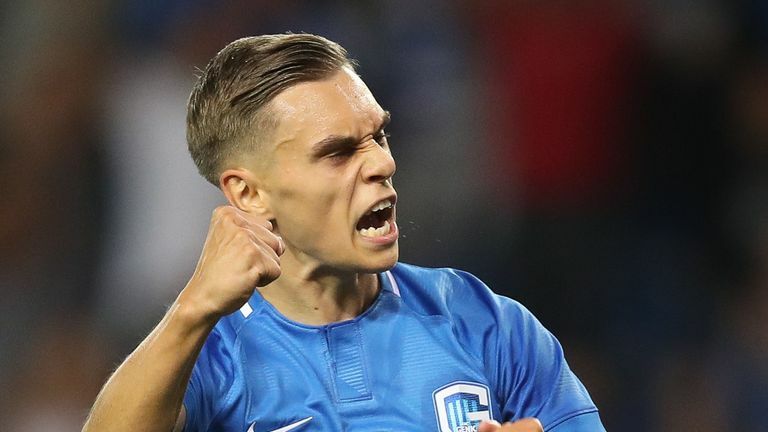 But while Vanaken came on for Hazard, it is the youngster Leandro Trossard who wants to be Hazard. Training with the Chelsea star this week has been inspiring for the 23-year-old, who has already scored three goals in six games this term for Genk, who are second in the Jupiler League. Trossard told Sky Sports News that Hazard "is my favourite player. He plays my position and I spent the week learning from him, watching him. It's great that players from the Belgian League are being given a chance. It means we can show we can get to a higher level". Sadly Trossard was not given a chance to show his international potential at Hampden - the only one of the four new names not to get a minute against Scotland - but the feeling around the camp is that he will get his debut in Iceland on Tuesday. Many in the Belgian media who report closely on the team believe that, in the long run, Trossard and Vanaken are the best placed to succeed at international level. And with five minutes to go on Friday night, with Scotland well beaten, the Belgium supporters were served with another new delicacy - a Birger; Gent's Birger Verstraete. 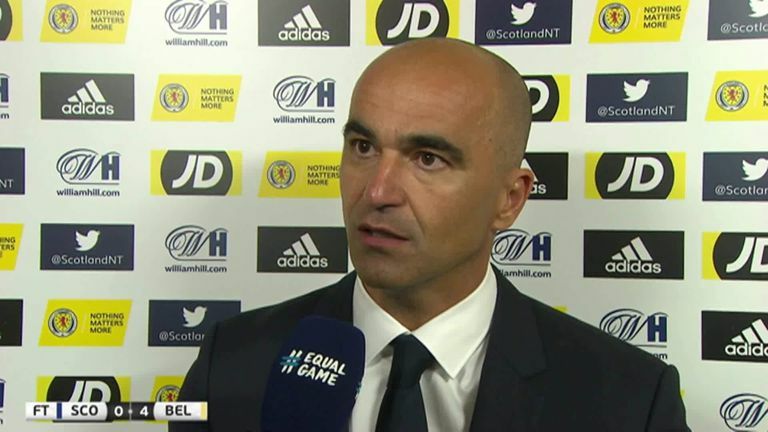 Belgium boss Roberto Martinez was proud of his team's attitude against Scotland. It was not a meaty amount of time for the 24-year-old, who has scored four goals from central midfield for fourth-placed Gent this term, but coming on to replace Tottenham star Mousa Dembele has made him hungry for more. "It was an incredible feeling to play in this amazing team. I was honoured and proud" he told Sky Sports News. "We have so many quality players in Belgium who don't even make the squad. It's nice to know the coach has noticed me. I now need to work hard and stay humble." At the World Cup, the average age of the Belgium squad was 27.6 years old. But a number of Martinez's usual first XI are now over 30 and not assured of a place the next time the tournament rolls around. Thomas Vermaelen and Vincent Kompany are both 32, Dries Mertens, Jan Vertonghen and Mousa Dembele are 31, while Simon Mignolet and Marouane Fellaini both 30. Toby Alderweireld and Axel Witsel will be 33 when the world travels to Qatar in 2022, so it seems Martinez had realised that now is the time to blood new talent.